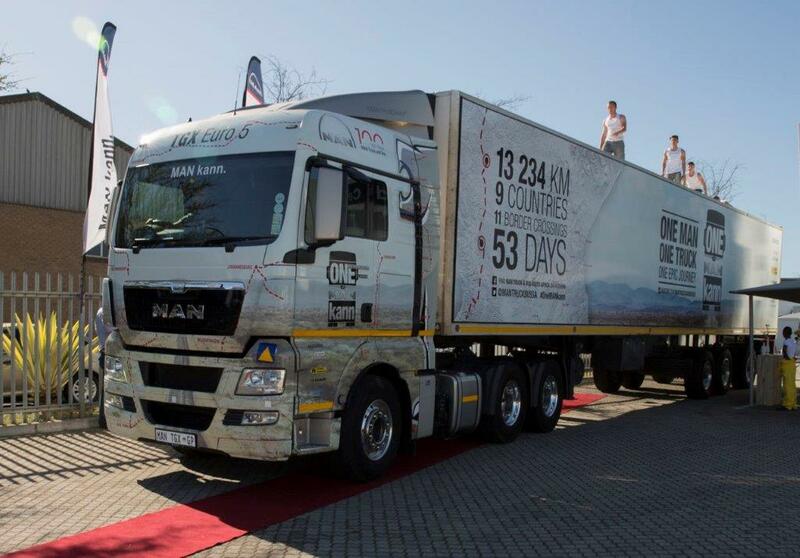 After six weeks on the road, crossing 11 border posts across nine southern African states, the ONE MAN kann Journey rolled into Cape Town to visit the MAN Truck & Bus dealership in Brackenfell. 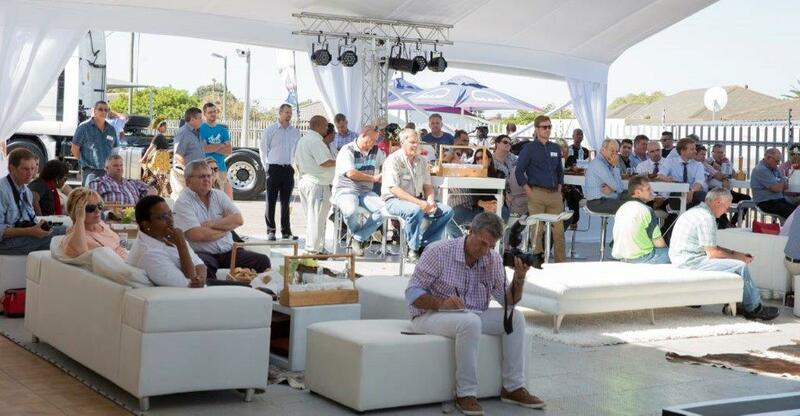 The crew, led by adventurer, Riaan Manser and professional longhaul truck driver, Nduna Chari, who are piloting the new Euro 5 MAN TGX 26.540 on its maiden voyage, engaged with a crowd of over 100 guests at the commemorative event held at the dealership on 26 October. Opening proceedings was MAN Truck & Bus SA Managing Director, Geoff du Plessis, who welcomed MAN customers, members of the media and strategic partners on the ONE MAN kann Journey (MANLINE for loaning Chari, VW for use of two Amarok bakkies, Henred Fruehauf for the trailer, Castrol, Good- year and Roll Back Malaria). “Cape Town is an important centre for MAN with this Brackenfell dealership so strategically positioned along one of South Africa’s busiest logistics corridors, the N2. Furthermore, Cape Town’s economic impact on the South African economy is significant, with tourism, agriculture, technology and education each giving the city a unique position in both domestic and international arenas. “MAN has been a contributor to the development of the city in no small way over several decades and it is a pleasure to share the ONE MAN kann Journey with all our guests here today,” said du Plessis. The Journey, which commenced in Pinetown on the 8th of September, has provided a platform for MAN Truck & Bus to showcase not only the new flagship TGX 26.540 6x4 Euro 5 longhaul truck-tractor but also a host of new developments that are geared to position MAN as the leading supplier of heavyduty trucks and buses in the SADC region. From the solarpowered carbon-neutral assembly plant in Pinetown, to new private capital MAN dealerships opening in Maputo, Nairobi, Lusaka and Windhoek, to new business solutions that form part of MAN’s integrated aftersales service offering, the ONE MAN kann Journey provided the ideal plat- form to showcase MAN’s evolution as a leading transport solutions provider to a point where it is now positioned to provide existing and future customers in the region with an unprecedented support and service infrastructure. “After 49 days, the epic ONE MAN kann Journey is nearing completion. It has been a fantastic adventure - one that has brought the challenges of crossborder transport closer to our followers as well as proving the efficiency and feasibility of the TGX for longhaul application in Africa and the growing capacity of our Sub-Equatorial dealer network. “The Journey also highlighted the efficacy of our driver-training programme, ProfiDrive, which prepared Riaan for this odyssey. All told, the ONE MAN kann Journey will serve as a historic landmark for MAN internationally, one that commemorates our organisation’s 100-years in the diesel truck industry as well as MAN Truck & Bus SA’s 53 years in South Africa,” stated du Plessis. MAN’s business solutions include MAN Financial Services, repair and maintenance contracts, MAN TopUsed, MAN TeleMatics and driver training via ProfiDrive. MAN Truck & Bus SA also announced the introduction in South Africa of MAN Trucker’s World, a professional driver’s club and MAN Service Care. “MAN Trucker’s World recognises top performing drivers like Nduna and Riaan, in our customer fleets and all TGX drivers will gain access to the club. MAN Service Care is an email and SMS service alerting fleet managers to stipulated vehicle servicing requirements and will be offered free of charge to all TGX, TGS EfficientLine and MAN’s repair and maintenance contract customers,” van Graan explained. 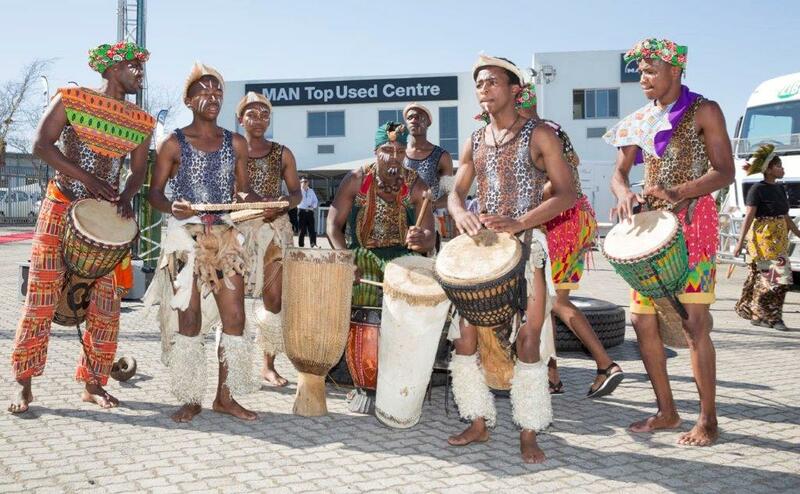 The ONE MAN kann Journey visits Bloemfontein on 29 October and concludes its odyssey at MAN’s Centurion dealership on 30 October.